What are these mutant yellow-jacket type hornets??? My back yard is wooded, partially heavily-wooded, and I seem to have these gigantic huge hornets that are attracted to my lights at night. I thought bees and wasps/hornets were still at night. What are these things and are they as scary as they look???? I could try to get a picture but they are really a bit scary.....they actually look like a giant yellow jacket (or ground wasp). no, these are definitely not anywhere close to that---they are yellow-striped like a yellow jacket but HUGE!!! I may be able to get a picture within a week. If I turn the outside light on while it's dark, there will always be 4 or 5 flying around the light in minutes....I'll see if I can zoom in and get a picture. Sounds alot like a giant hornet. this is exactly what it looks like!! My neighbor just saw one and called it a European Hornet...after researching online it seems the European Hornet only reaches 1-1/4 inches but, unless I'm hysterical, the ones I have look a little larger than that. Is this giant hornet a European Hornet? Try looking up the "Cicada Killer" too. They're as big as a man's pinky or a woman's thumb. Here's the one that landed with a loud combined buzzing that sounded like a powertool, not 4 feet from my kids the other day. I had no trouble ID'ing it because it was clutching a green cicada. 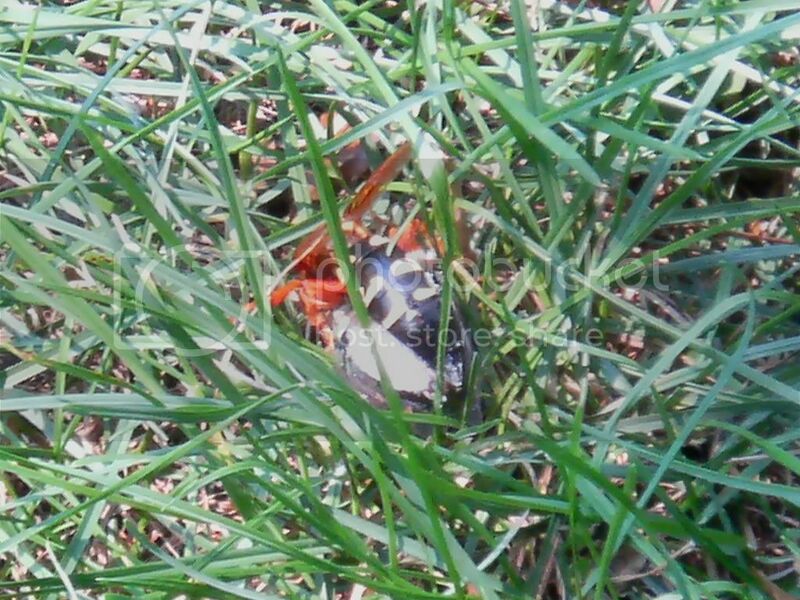 ok---it's definitely not a cicada killer, but you got a couple of great pictures!! And I had forgotten, but I remember seeing the cicada killers a lot when I was a kid....too many years ago! Dogpatch318 wrote: this is exactly what it looks like!! My neighbor just saw one and called it a European Hornet...after researching online it seems the European Hornet only reaches 1-1/4 inches but, unless I'm hysterical, the ones I have look a little larger than that. Is this giant hornet a European Hornet? 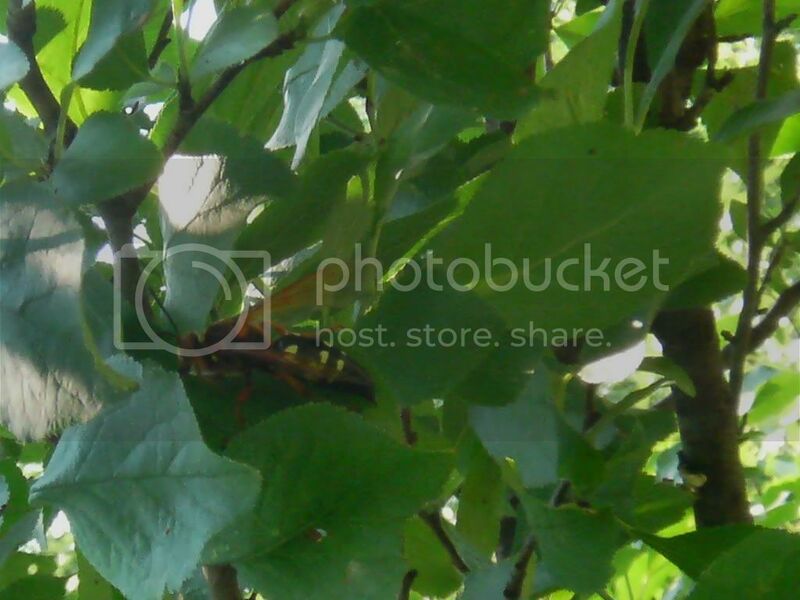 Its a European hornet, which according to wikipedia gets up to 1.4 or 1 1/2 inches. I swear I've seen bigger though around here. My dad grows apples and they love to get into rotting ones, but mostly they prey on the other insects that eat the apples like yellow jackets, junebettles, japanese beetles, ect. Other then there sting they aren't really bad to have around since they prey on alot of insects that are considered pests. They evidently have a nest in one of the trees in my woods---I'll have to take notice and stay clear of that! Yeah they look scary but as long as you don't distrub the nest or step on them they will usually leave you alone. Getting rid of ground hornets----QUICKLY!!!! I have been stung by these (ground hornets). Their venom is designed to mimic extensive tissue trauma in the victim. The stings really hurt. The process; Wait until well after dark, I saw no bee activity after 9:30pm. They were all in the nest. I dumped about a quart of 'Coleman Camping Fuel' down the hole, lit it and then backed off. I would never use gasoline because of it's explosive properties. The Coleman Fuel burned with good control. After about ten minutes (of burning) I uncoverd a nest larger than a basketball under my flower garden with tens of thousands of dead bees. This process worked very well for me. GROUND HORNETS - How to Get Rid of? Are these bees or wasps/hornets?